I LOVE a good color moment!!! I just have this thing with color! 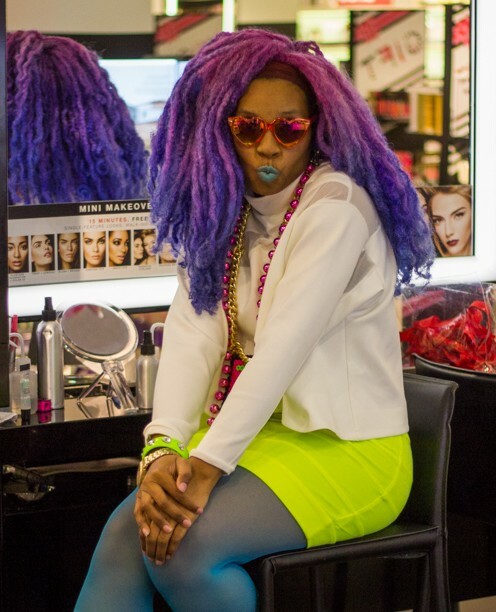 It feels so alive, so vibrant and wearing color makes me feel like I'm living, dreaming, and BREATHING in COLOR! When Court Introduced me to YOYO Ferro, Atlanta's own, I was immediately drawn to his love for Vibrant poppy color. His images where interesting, fun and had a strong sense of humor. And I love to laugh! I can be honest and say they became much more impressive once I knew majority of his work is done without the pencil leaving the page once he starts! That's how his images get that Unique look and YOYO Ferro's Personal style, as an artist! Cool, huh! This Giraffe speaks to me!!! I have a thing right now for Giraffe's. I bought a print of one the other day to go in my new studio loft! When I saw YoYo Ferro's I wanted him too! I think what I like about this one and the one that I bought (it's similar) is that the Giraffe isn't typical! By Nature Giraffe's are unique looking creatures! The "torso" of a horse but the neck of the empire state building! Kinda like swans but I wont digress! These creatures seem "naturally" embellished but I love how YoYo Ferro allows Giraffe's own Personal Style to pour out over this canvas, it's own self expression. If I where into pets this would be my pet! 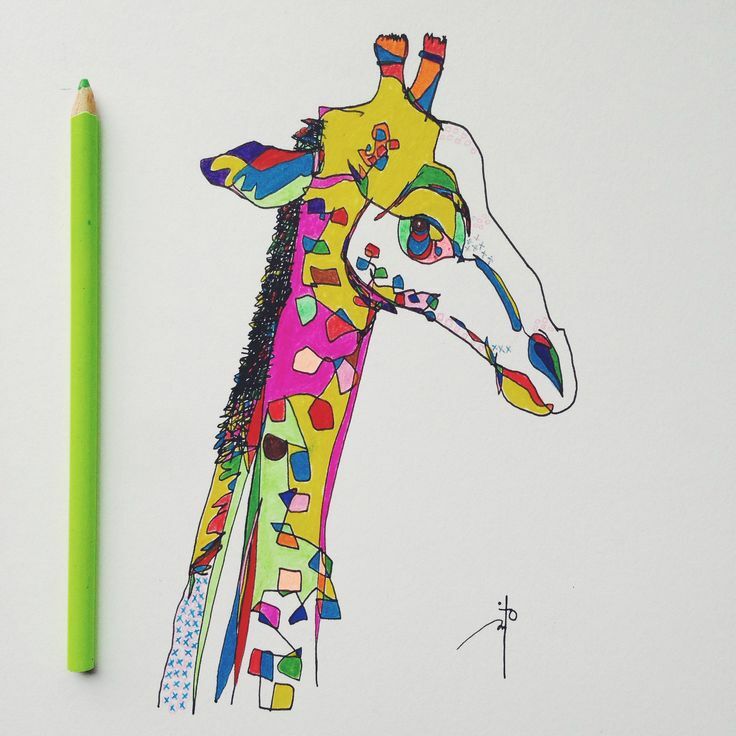 This multicolored giraffe with the mischievous glint in it's eyes! WITH the TWO tone lipstick! I feel like, I know this Giraffe's story! The other day I read the blog of an instagramers that I follow, to learn more about her and have more context for the images that she shared! She'd written this post talking about style/fashion/personal style bloggers. A couple of her biggest grips points were A) Wonder where the F#$% these people wear this stuff B) That she would NEVER wear half the stuff she saw C)Appreciated the bloggers in this genre whose "looks" made sense. I thought this was an interesting perspective. I've never thought about style this way! I've always seen it as a means of expression! For me fashion should be one of four things: A) Fantastical B) Inspirational C)Relatable D)Aspirational. #ONWEDNESDAYWEWEARART, we are Inspired by art, from week to week we are Fantastical, in our own looks and expression we are most certainly Aspirational, and we graciously hope we are relatable! You get me right??? Yea... I knew so (hugs and kisses, hugs and kisses)! So when I look at other bloggers, artist and creators that are doing things that I might not "get", I ask myself what of this does speak to me and if it challenges me why. My friend since the 9th grade. She and I are totally each other's go to about the latest in fashion, hair, and makeup (We, legit, can talk about lip gloss for 3 hours straight!#NEVERadnauseam). We share the same view points BUT have two completely different personal styles. She's been a really great friend to me; though she thinks it's quite a lot that I love prints (and so much color) she always hypes the fact I can unconsciously wear three prints, like some people wear, capsule looks of all gray, black, and white. With out her pointing that out to me I never would have realized this gift! It's the same with her! She's into labels, classics, and trends. So all her outfits are a beautiful stylized presentation of high low and she nails her personal style inspo EVERYTIME! I just love it! So when ever my head is too full and I need help I love to work with her because she gets me but brings her clarity of "chicness" to the table and we create beautiful looks! This inspite of half the stuff I wear (and own) she would never wear (or own). We even trade things we own when we think the other could just do it better! She has however started wearing a maximum of two prints but as she puts it "nothing too outrageous". She told me I inspired that, LOL. But isn't that the my point. 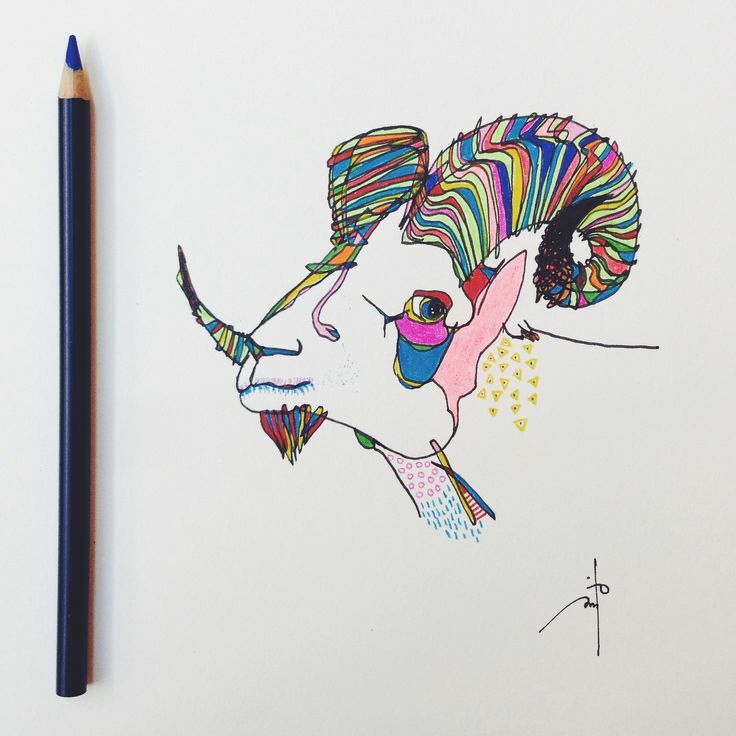 Art challenges us to open our minds and retire our linear perspectives. It gives us pathways to see the world and to express our lives. Our hurts, Joys, and Pains! It's a carefully and some times haphazardly constructed visual story of who we are. Al la, the true beauty in personal style and seeing what you wear as wearable at! From Black and white to Techna Color it's ALL telling your story! Just look at me and G. Raffie! And these stories here, here, and here; that I've collected from strangers on the streets and other fashion bloggers. It's really fun to do and read! It will either resonate with you or challenge you! If you don't like it AT ALL, that's cool but just know that's a sign that it resonates with you. It just hits your Dislike vs Like button! Cool? I want to hear your thoughts! How do you keep your personal style fresh? Where do you get your inspiration from? What are the things in others personal style that resonate with you? And for more BEAUTIFUL COLOR and Art inspired attire Please check out my friend Court! I totally enjoyed her usage of color!